Jack (Jacob Tremblay) has just turned five, but has lived his entire life locked inside a small square room with his beloved Ma (Brie Larson). The only glimpse he has ever gotten of the world is through a small skylight, believing that outside is space and everything else only exists in the magical world of television. Ma is fiercely committed to protecting her little boy, and will do anything in her power to get him out of this single room where he was born, but adapting to the unexpected expanse of the real world might just prove to be even more challenging for both of them. Because this tiny prison enlivened by fantasy is all Jack has ever known, the disturbing nature of the situation, and nightly visits from their predatory captor Old Nick (Sean Bridgers), are viewed by him as just normal parts of his life experience. 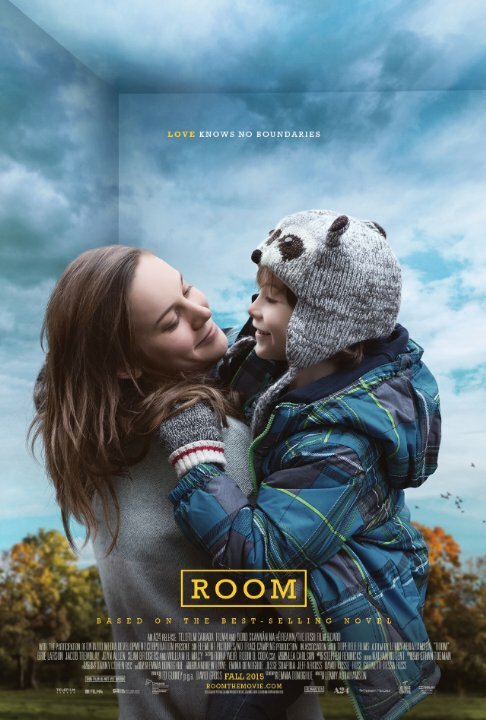 This is the fascinating premise behind Room, a staggeringly powerful piece of work that explores themes of isolation and freedom, and how they affect a child’s overly accepting but constantly evolving outlook on life. Like in Emma Donoghue’s bestselling book of the same name, which was written entirely from the perspective of a five year old, the film offers a remarkable window into a child’s eye view of the world around him. Because everything is seen through Jack’s eyes, we are never given any more details than he has at the time, meaning that many of the more disturbing elements are kept simmering just below the surface, and the material is all the more heartbreaking for it. Working from a screenplay that the author adapted herself, director Lenny Abrahmson perfectly captures this distinctive voice of the book, often shooting from low angles and using close ups to mimic the vantage point of the young lead. The camera follows its young protagonist through the frames, always taking his lead. The results are captivating to watch, giving Room a distinct visual look and feel, that is further supplemented by a palette that utilizes the grey tones and confined spaces of the first half to create a sense of claustrophobia, before amplifying the brighter colours of the second half. The stellar performances also successfully help lift the story from page to screen. Brie Larson brilliantly portrays both the tortured pain and resilient strength of her character, and it’s an exceptionally nuanced piece of work that is profoundly moving to watch. Young Jacob Tremblay never hits a wrong note and displays an incredible amount of depth for a child actor, with his wide open eyes powerfully showing both his terror and awe of the world around him, simultaneously stealing our hearts and breaking them wide open. This is one of the all time great performances from a child actor. The film is comprised of two sections, with elements of increasingly tense escapist thriller in the first half and escalating family drama in the second, each taking up almost exactly half of the two hour running time. This dual act structure is unique in itself, and a stunning extended sequence that bridges directly between the first and second half is pulled off with such expert pacing and pulse pounding suspense, that it literally took my breath away. It’s one of the finest cinematic passages in recent memory, a gutting sequence that instantly grabs us and never lets go. I’ve seen this film twice now, and both viewings were equally gripping experiences, with the outstanding performances from Brie Larson and Jacob Tremblay elevating it all to the realm of unforgettable. This is a disturbing, unexpectedly inspiring and emotionally powerful drama, casting a unique spell that is almost hypnotizing to watch, and just as hard to shake afterwards.